Michael Bisping's ongoing Twitter war with Tim Kennedy may materialize into a war inside the Octagon. After a lengthy period on the sidelines following two surgeries to repair a detached retina in his right eye, Michael Bisping can finally think about fighting again. Just last week, he was cleared to spar, and if he suffers no setbacks, he hopes to return in the spring. Against who? Well, that’s a question with a seemingly unlimited set of possible answers. After all, everyone within shouting distance of 185 pounds seems to have called out Bisping at some time or another. The latest thorn in his side has been Tim Kennedy, the American former Special Forces member who has won both of his Octagon bouts since debuting in July. I just really, really want to punch him in the face. Kennedy has harangued Bisping on social media, and apparently, the extended offensive has worked to some degree, because while Bisping once had no interest in the fight, he now admits that it’s growing on him. "The answer is very, very simple of why I would even entertain a fight with Tim Kennedy," he said during a Friday question-and-answer session. "He’s had three fights in the UFC against nomads and he didn’t even look that good in those fights. He’s been calling me out for years. You know, at the start, I didn’t want to respond to any of his tweets and things like that because it’s giving him what he wants. He’s trying to create buzz and a bit of hype about himself. So at first I was ignoring it. I thought, I don’t want to fight this guy because I want someone who’s going to get me a title shot, and I don’t want to play into his game, so I’m not going to respond." I might as well call the UFC, get paid, and beat him up. With his November knockout win against Rafael Natal, Kennedy broke into UFC’s rankings, taking the No. 10 slot. That’s six spots behind Bisping, who has won two of his last three, most recently defeating Alan Belcher in April. 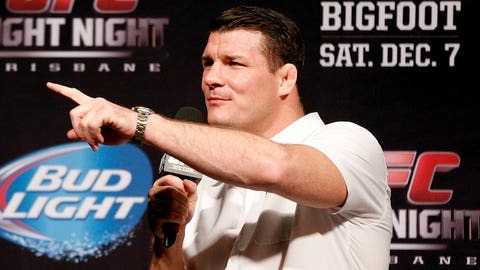 With plenty of potential opposition, Bisping could look in any of several directions and find a potential foe. The 34-year-old still has his heart set on moving toward a title shot, but he may first take a pit stop. He’s always seemed to enjoy fights with some personal angle, and as time passes and Kennedy continues on with his campaign, Bisping seems to move in that direction. "In a perfect world, obviously I want a fight that’s going to propel me towards a title fight," he said. "That’s still my dream, that’s still what I’m pursuing. Any fight that gets me towards that. The middleweight division now is absolutely stacked. You’ve got [Ronaldo] Jacare [Souza], [Lyoto] Machida, the list goes on. Probably one of those guys. Probably Jacare or Machida or [Luke] Rockhold. The list is non-stop. Mark Munoz and me agreed to fight. So maybe there’s unfinished business there as well. But Tim Kennedy is doing a good job of getting himself punched in the face if he carries on, so probably Tim Kennedy."